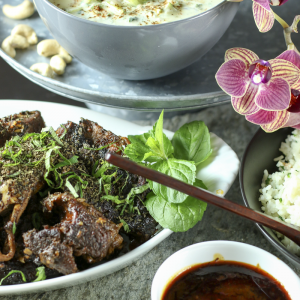 A deliciously spicy, fork-tender lamb is braised in Indian/Kashmiri spices for a wonderful one-pot meal for entertaining or a special meal at home. It is gluten-free and can be made ahead. Sweet potato coins form the crust to this delicious, vegetable-dense, gluten free pizza, topped with Fontina cheese, prosciutto, caramelized onions, corn and cilantro. Zoodles are topped with a roasted leek, pancetta and sun-dried tomato sauce for a delicious low-carb, gluten-free, paleo-friendly, vegetable-dense pasta-like dinner. 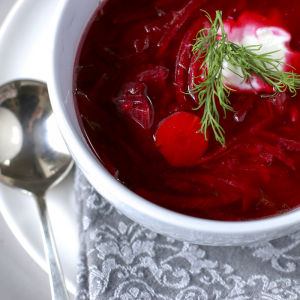 This simple, healthy beet soup is the antidote for weeks of holiday indulgences. Packed with nutrition, beets have been shown to lower blood pressure, increase stamina, purify the blood and liver, fight inflammation and boost mental health. What are you waiting for? 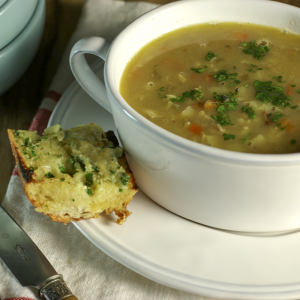 Make this soup today! This easy and festive appetizer made with goat cheese, sun dried tomatoes and basil is beautiful around Christmas and New Year's, but delicious any time of the year. Aebleskivers are a delicious Danish filled pastry that is somewhere between a pancake and a popover. Traditionally served during the Christmas holidays, aebleskivers can be eaten for breakfast or dessert. Butternut squash, cauliflower and a little gruyere cheese make a flavorful gratin that is a wonderful accompaniment to a holiday roast. This gratin can be made in advance and warmed up right before serving. This 3rd generation family toffee recipe is unfortunately addicting. Once you eat a piece it is hard to stop. Package it in mason jars for delicious DIY Christmas gifts.